De samenwerking tussen het CIHC en het wetenschappelijk tijdschrift Wacana ‘Journal of Humanities’ van de Universitas Indonesia in Jakarta heeft geresulteerd in een tweedelig themanummer ‘Chinese Indonesians in Historical Perspective’ Vol 18, No. 1 en No. 2 (2017), onder redacteurschap van Susi Moeimam (redacteur Wacana) en teamlid Maya Liem. In 22 artikelen wordt een grote verscheidenheid aan onderwerpen behandeld; de auteurs zijn verbonden aan diverse wetenschappelijke instituten in Nederland, Indonesië en Japan of zijn zelfstandig onderzoeker. Mary Somers Heidhues, Kwee Hong Sien, Francine Brinkgreve, Willem van der Molen en Siem Tjong Han. Het dubbelnummer kost Rp 120.000,-; verzendkosten bedragen ong. Rp 200.000,-. Nadere informatie kunt u inwinnen bij Hana, wacana@ui.ac.id. Wacana is online in te zien op de website van Brill: http://brill.com/waca. Het is mogelijk de artikelen te downloaden in Pdf. 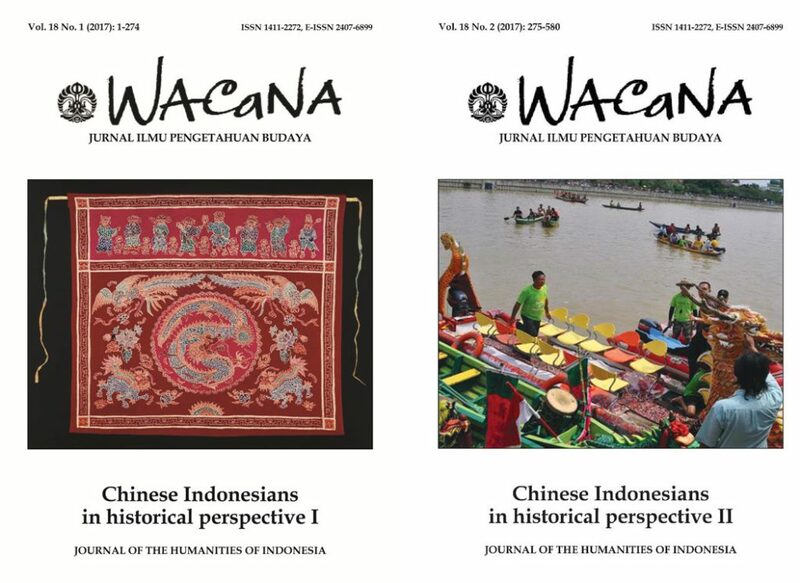 It is a great pleasure to publish a comprehensive double issue edition of Wacana, Journal of the Humanities of Indonesia which is centred on the theme “Chinese Indonesians”. Although scholarly research on this topic got off to a good start in the 1980s, in the last few decades we have witnessed a strong increase in the interest in many aspects of the life of Chinese Indonesians. This double issue edition of Wacana is a reflection of this ongoing trend. As can be seen from the indexes, the articles deal with a wide variety of issues in the fields of history, cultural heritage, life history, politics, architecture, theatre, literature, linguistics and philosophy, and religion. The publication of this double issue “Chinese Indonesians in historical perspective I and II” is the result of a co-operation between the Chinese Indonesian Heritage Center (CIHC) in the Netherlands and Wacana. CIHC is engaged in collecting and preserving the cultural heritage of Chinese Indonesians who have migrated to the Netherlands. In its activities, the organization works closely together with the Royal Netherlands Institute of Southeast Asian and Caribbean Studies (KITLV) and other academic institutes, with the Nationaal Museum voor Volkenkunde (National Museum of Ethnology) and the Asian Library in Leiden. We sincerely hope that, as the result of a successful joint effort, this special edition will contribute to the stimulation of new studies on Chinese Indonesians in Indonesia, the Netherlands and beyond.